Although Alton Towers became England's first theme park in 1980 and has since grown into a renown destination for thrill-seekers and park lovers around the world, its unique history got off to a start as far back as the seventeenth century. It was then that Earl Charles Talbot settled into the countryside of Alton, England and created his residence on a 500-acre plot of land. The estate was fully landscaped and a Gothic mansion was built. From here Alton Towers has continued to thrive. Two generations later, Earl Talbot's grandson passed on without an heir to receive the estate, in 1857, and so began nearly a century of proceedings to find a new owner. That came to an end at long last in the 1940s when Alton Towers Limited was formed and purchased the former residence. Alton Towers eventually landed in the hands of a man by the name of John Broome in 1980. Broome wanted to introduce the theme park to England, and at the same time, retain the lush beauty of the landscape. And so the theme park concept hit Britain. All park-goers would pay a single admission fee to enjoy the rides, attractions, and scenery. Alton's first coaster, Corkscrew, opened with the park in 1980 from Arrow Dynamics, flipping riders upside-down twice during the 2,400-foot-long ride. Three years later, a second coaster was added and Black Hole began taking adventurers on a twisting course enclosed in darkness. Throughout the '80s, Alton Towers expanded its ride collection yearly and also added more themed sections to the park, introducing the Zierer-designed 4-Man Bob for the 1985 season and the steel Dragon Coaster (later renamed Beastie) the following year. Two years later in 1988, the park brought two more steel coasters to Alton with the addition of the fourth and fifth coaster tracks: Schwarzkopf's Beast, a twister with 2,862 track feet and a wild mouse from Vekoma named the Alton Mouse. The major growth wouldn't end there. In 1990, Alton brought the third-hand Schwarzkopf shuttle-looper named Thunderlooper. A shift in the park's ownership occurred in 1991 when the Tussaud's Group acquired Alton Towers with a new master plan for the growing park's future, as well as a few surprises up their sleeves. Tussaud's began that season with the removal of three of the smaller coasters - the 4-Man Bob, Alton Mouse, and Beast. The Tussaud's Group wanted to update the coaster collection with a revolutionary lineup of new coasters to put Alton on the worldwide map which would be dubbed 'Secret Weapon' rides. For the first Secret Weapon project, Arrow Dynamics was contacted to build a prototype ride coaster known as a 'pipeline', but after two failed attempts, the pipeline ride was scrapped. Two new steel coasters, however, did find their way into the collection in 1992: the New Beast and Runaway Mine Train. In 1994, the first Secret Weapon would finally become reality. 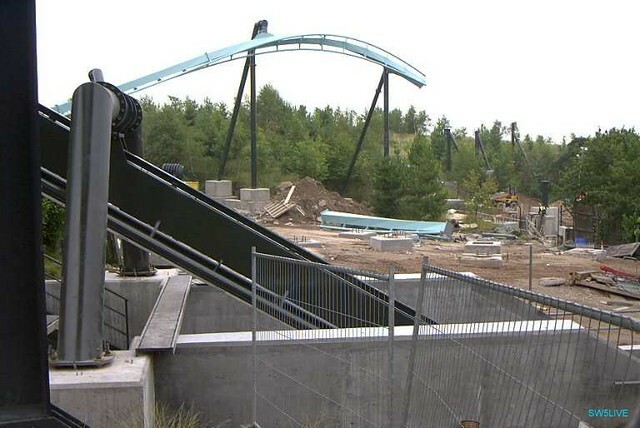 Project 'Secret Weapon 3' took shape in the form of Nemesis and opened as a very unique inverted coaster from Bolliger and Mabillard. Designed by John Wardley, the coaster was threaded through tunnels and trenches, the majority of the layout being situated below ground level in part due to height restrictions. Nemesis drew rave reviews from coaster lovers around the world for its one-of-a-kind course, four inversions, and heavy theming. Four years later, the next Secret Weapon was unveiled with Oblivion, the first of a new breed of coaster from Bolliger and Mabillard featuring a centerpeice near-vertical 18-story drop plummeting into the earth. And, keeping with the four-year pattern, March 16th, 2002 marked the debut of Alton Towers' fifth Secret Weapon when AIR: Aerial Inversion Ride took off as a laydown themed terrain coaster and the park's third B&M-manufactured ride. Since then, new "secret weapon" rides have been added consistently to the park, with each new ride trying to top the last. Alton Towers, as Britain's largest and oldest theme park, should be a definite destination for today's thrillseeker!